Di Francesco – Gasperi is a marraige of two families and two great friends, Luigi Gasperi and Ennio Di Francesco. 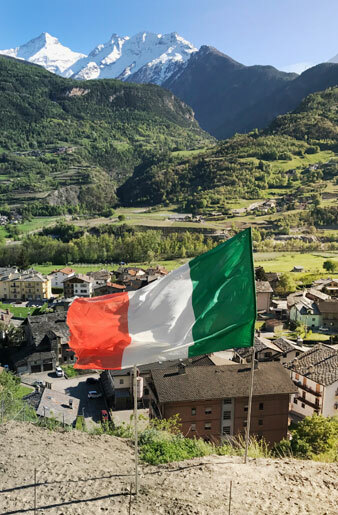 Ennio and his family moved from Liguria to Sant Pierre in Valle D’Aosta in 1947 as his father came to work in the nearby casino. Luigi and family are Valdostani through and through. These two friends, who met as youngsters, had an idea to revitalize the hill above the Di Francesco’s home that was historically planted to vine. What was once vine however turned to woods, with some vines still growing wild in the midst of this overgrowth. Both men were retiring and Ennio in particular loved to garden, thus they figured why not take on a bigger challenge! This is where Ennio’s sons come in, Stefano and Nicola, who took machetes and chainsaws in hand and began clearing out the hillside. Next came time to plant vines, which was a first time experience for this group. They leaned on the advice of friends in the wine business nearby but in they end they realized the advice they gave them on which varietals to plant and how to train them was not great. Eventually they would replant and retrain some of their vines. What remained constant was the incredible terraces that are unique to this property and Valle D’Aosta. The terraces were actually built over 100 years ago by prison inmates who were forced to create them. In this mountainous region the only way to go is up so there is no choice but to plant this way. The terrace walls built with rocks actually take in the heat from the day and emit that heat during the evening into the vineyard, which is important in a region with large temperature variations between day and night. These terraces would help maintain a higher overall temperature, which is crucial in this cold region. In all the property is tiny, with 1.5 hectares planted to vine. What is truly remarkable is that some of these aforementioned terraced truly hang of the side of the cliff and they might just be 10 feet long and 3 feet wide. With spaces this small only 4 or five plants can be planted. This is how dedicated these two families are, planting vines on every possible space, some seemingly not even worth the effort to plant and maintain, but they do it anyways. Each decision has to be strategic given the space so there have been some disagreements among the group on not only where to plant, but which varietals. Each of these small terraces is named ‘Discordia’ or discord to note that it wasn’t planted without consensus and to this day remains still under contention! In fact, every terrace is named with a particular significance to the families based on the significance to the families or the location of the vines. There is a terrace called ‘piscina’ or pool because the terrace is rectangular and shaped like a swimming pool. Then there’s ‘Jean-Mannaggia’ or damn you Jean. Jean, Luigi’s son (also involved in the winery) who wanted to plant vines on one of the most difficult parts of the hillside. The stone wall needed to be rebuilt on this tricky track and the group yelled Jean-Mannaggia (or damn you Jean!) the whole way through. Of course, the property all started with Wilma I, II, and III the first three tiny terraced named for Ennio’s wife where this dream all started. Each sign with the terrace name also indicates the number of plants, and as you walk around the property there are a surprising amount of single and double digits! These terraces are all connected by narrow paths that wind their way up the hillside, it takes about 10 minutes to get from the bottom to the top and it’s literally a hike. This is truly heroic wine making, there are no two ways about it. If I hadn’t meant this family and understood how passionate they are I’d almost take them for being crazy! At one point a friend of theirs who was giving a hand in the vineyard, slipped and fell off the hillside about 50 feet, thankfully surviving the fall. This is mountain climbing meets wine making. In total these guys make 5,500 bottles of mostly Petite Arvine and Fumin. The wines are made naturally without and intervention or filtering. This choice leads to truly terroir driven wines made with incredible sacrifice. 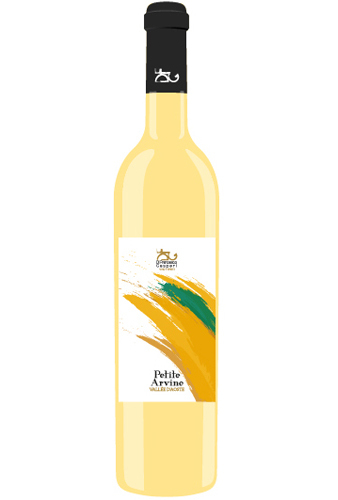 Fumin, in particular is an extremely difficult grape to farm and also to drink. Often times these wines are highly tannic and spicy, bordering on herbaceous. 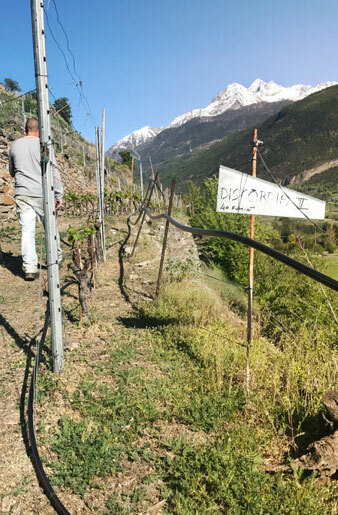 Many wineries either blend the grape or actually leave the grapes to dry a few days after harvesting to help tame these tannins, but Di Francesco-Gasperi does nothing of the sort. They claim that each vintage of Fumin is dramatically different and its true. I had the pleasure to taste from 2012 through 2015, each was a product of what the weather gave them. 2013 and 2014 were vintages with bad weather and not tons of sun and those two wines were a product of that. 2015 was an incredible growing season that allowed the grapes to hang on the vines a bit longer and this wine (which is our current offering) has incredible elegance that the two vintages lack. 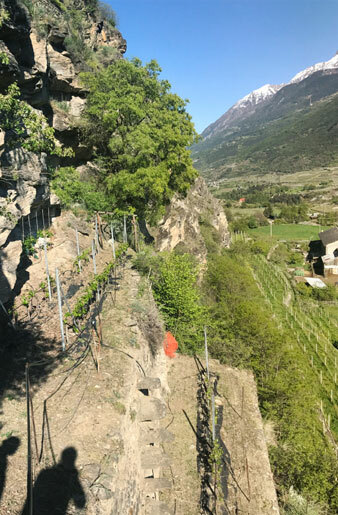 Minerality and complexity made from vines hanging off the mountainside in Valle d’Aosta. Spice, flowers and leather. Fumin is quintessential Vall d’Aosta.